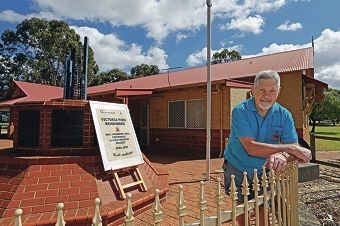 Victoria Park RSL president Kelvin Liddiard is co-ordinating the memorial wall project. President Kelvin Liddiard said the event would not only herald the branch’s annual general meeting but raise the profile of its project to fund a brick wall to display about 600 bronze plaques honouring those from the Town who enlisted or volunteered in the Great War. An online crowd-funding project plus a call for traditional donations has begun to finance the wall that will cost about $120,000. The rest of the funds will be used to buy, engrave and attach the plaques. Mr Liddiard said the open day would help people understand and learn about its various historical projects. Contributors can make a $10 personal donation, a $150 business donation, choose a $500 adopt a digger package or buy a $25 commemorative video, a $50 replica Anzac dog tag, or a $75 video and dog tag package. By last Friday ” just over a week since it was launched ” the site had received just over $900 in pledges.